Regular readers of the MF blog know the museum tries hard to maintain environmentally responsible organizational procedures. From our use of QR Codes in the galleries and facility-wide CFL lighting to the retro-fitting of our properties and GREEN membership program, we strive to make sure what we do has the least amount of impact to the environment as possible. And now I'm happy to announce we're extending that mission into our product selection in the MF shop. Many of the new green items in the shop come from Useless, an organization that focuses on using less and giving more in order to maintain a better planet. The organization is based around the reuse of materials to create chic, eco-friendly products. Think about all the useless things that we buy everyday, and then consider putting your money to a good cause like Useless. 10% of their profits fund clean water and sanitation projects around the world. You can see the exact project your money is going to by visiting their website: www.useless.org. All of their products are made in the USA and are created from recycled and sustainable materials. The MF Shop offers their BPA-free, recyclable water bottles, organic cotton tshirts, in both men's and women's sizes, and billboard tote bags. And for a short time only, you can add a MF Green Membership to any Useless Merchandise (or any other Green product) purchase for only $40! 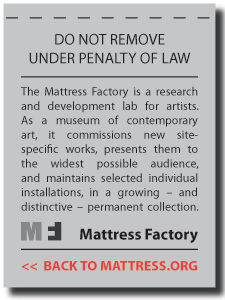 (A $10.00 discount) So think about the Mattress Factory in your own mission to "go green," and become a Green Member today! It's that time again. We're three weeks out from the opening of another Gestures exhibition! 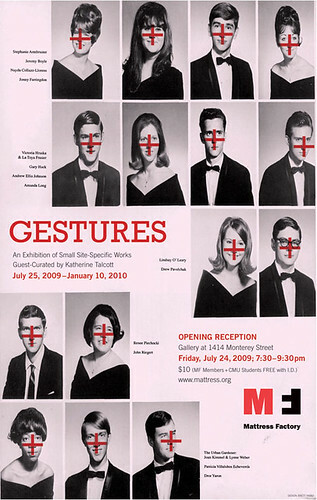 This, the thirteenth installment in the Gestures Exhibition Series, will open with a public reception on Friday, July 24, from 7:30 PM to 9:30 PM. If you plan to attend, you can RSVP and keep tabs on who else will be there over on FaceBook. We had such a blast working with guest-curator Katherine Talcott on Gestures 12 that we've asked her to curate this upcoming exhibition as well. Katherine has chosen some amazing artists including Stephanie Armbruster, Jeremy Boyle, Nayda Collazo-Llorens, Jonny Farringdon, Victoria Hruska & La Toya Frasier, Gary Huck, Andrew Ellis Johnson, Amanda Long, Lindsay O'Leary, Drew Pavelchak, Renee Piechocki, John Riegert, The Urban Gardener: Joan Kimmel & Lynne Weber, Patricia Villalobos Echeverria and Dror Yaron. This is where you come in. With each new exhibition and event, we are consistently blown away by the support from our online community. I've embedded two sizes of electronic flyers (complete with corresponding HTML code) below. Feel free to help spread the word by posting these awesome Brett Yasko-designed flyers within your social networks and emailing to the art-loving friends in your contact book. Anything you can do is greatly appreciated by the artists and all of us here at the MF! I hope to see you at the opening on July 24.